The sides clashed in O’Connor Park in Tullamore this afternoon. 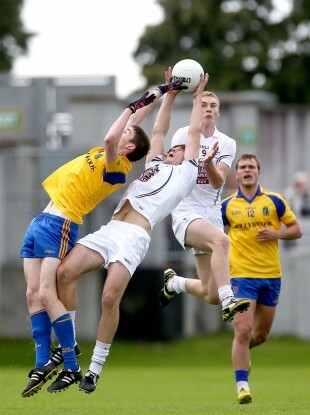 Kildare's Pascal Connell and Luke Flynn with Cathal Compton of Roscommon. ROSCOMMON’S GOAL SCORING power enabled them to stave off the challenge of Kildare in today’s Electric Ireland All-Ireland minor football quarter-final in Tullamore. Bouncing back from their Connacht final loss to Mayo, Roscommon triumphed despite being reduced to 14 men when Tadhg O’Rourke was shown a second yellow card. Yet their 14 men coped in the second-half and after leading by five points at the break, they held on to that lead until the finish. The three goals they bagged in the first-half proved integral to their success with Ultan Harney, Diarmuid Murtagh and Diarmuid McCann all finding the net. Roscommon got off to a cracking start with Harney and Murtagh finding the net while Jack Earley and Henry Walsh both landed points to send them into a 2-2 to 0-0 lead. Leinster champions Kildare were left reeling but they fought back to string together three points in succession from Neil Flynn (2) and Chris Healy. But then Roscommon fired home their third goal through Diarmuid McCann to extend their advantage. Wayne Fitzpatrick, Cian McMonagle and Flynn all pointed before the break to bring Kildare back into contention as they trailed by five points while Roscommon were then hit by the sending-off of O’Rourke. Roscommon got off to an ideal start to the second-half with quick points by Harney and McCann to go seven points clear. Kildare fought back with Fitzpatrick, Flynn, McMonagle and Jamie Connolly all on target as they notched points. At one juncture Kildare had cut the gap to four points, 3-6 to 0-11, yet they missed a free at a crucial stage and Roscommon went downfield to relieve the pressure with Ronan Daly grabbing a point. Murtagh added another and there was no way back for Kildare despite Ben McCormack shooting over a late point. Scorers for Roscommon: Diarmuid Murtagh 1-2, Diarmuid McCann, Ultan Harney 1-1 each, Henry Walsh 0-2, Jack Earley, Ronan Daly 0-1 each. Scorers for Kildare: Neil Flynn 0-5 (0-3f), Cian McMonagle, Wayne Fitzpatrick (0-2f) 0-2 each, Jamie Connolly, Ben McCormack, Chris Healy 0-1 each. Email “Roscommon strike 3 goals to defeat Kildare in All Ireland MFC quarter-final”. Feedback on “Roscommon strike 3 goals to defeat Kildare in All Ireland MFC quarter-final”.